A footballer who broke the jaw of the opposing team's captain has been ordered to pay him £1,000 compensation. 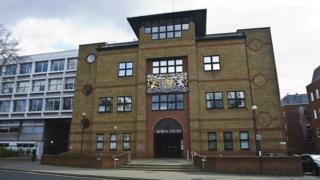 Daniel Puzey, 25, hit Ashley Thompson during a heated Hertfordshire Senior League match, St Albans Crown Court heard. Puzey, of Stockford Avenue, Barnet, had denied inflicting grievous bodily harm but was found guilty by a jury. As well as the compensation, Puzey was told to carry out 120 hours of unpaid work and pay £250 in costs. The court heard how Puzey and his brother Jason Puzey were playing for Belstone FC, of Radlett, against Ware when the incident happened in October 2015. In the last minute Jason Pusey put in a hard tackle on Mr Thompson, who went to the ground. Words were exchanged between the two players, the court was told. Puzey then ran over and hit Mr Thompson in the face, breaking his jaw. There was no reason for the punch to be thrown, said prosecutor Edward Hollingsworth. Alex Britton, defending, said: "It was an isolated incident. He has shown a genuine expression of remorse."